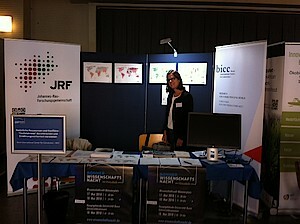 BICC again participated in the 11th Bonn Science Night with an information stand. The Bonn peace and conflict research institute offered information on "Natural resources and conflicts—breaking the 'vicious circle'" as well as a quiz to test one's knowledge on this topic. From 6 p.m to midnight, its stand was located in the cloak hall (Garderobenhalle) of the main building of the Rheinische Friedrich-Wilhelms-Universität Bonn. Researchers presented the module "Resources and conflicts" of the digital information portal 'War and Peace', which BICC has developed in cooperation with the German Federal Agency for Civic Education (bpb). The cacao tree and the oil palm are important agricultural commercial goods on the world market. Events in the past have shown that these natural resources can contribute to conflicts. In some cases, the sale of these resources finances parties to a conflict and thus makes the conflict last longer—a vicious circle emerges. These goods are mostly grown in tropical regions where they contribute little to strengthening local food security. Visitors to the stand could call up all information around natural resources and conflicts online by way of interactive maps.